Several legume genes involved in establishing nitrogen fixation have been discovered using functional genomics; when mutated, the genes affect symbioses, and all encode receptor kinases. This provides long-awaited insights into a complex plant-bacterium interaction and heralds the possibility of extending the range of plants susceptible to nitrogen-fixing nodulation. Plants are essential for life on this planet; they convert solar energy to chemical energy that we eventually use as food, fuel, feed and fiber. But plants can do this only if they have nitrogen, the most limiting element for the synthesis of proteins, amino acids, nucleotides and vitamins. Nitrogen is commonly assimilated as nitrate and modern agriculture is highly dependent on nitrate fertilizer, with global annual nitrate fertilizer costs exceeding US$300 million. Moreover, nitrate often contaminates ground water and surface streams, causing environmental and human health problems, at a cost that possibly exceeds several billion dollars. Some plants are naturally able to acquire nitrogen from the air through a process called symbiotic nitrogen fixation. In broad terms, this process requires a close interaction between a soil bacterium, Rhizobium, and the roots of plants of the legume family (which includes soybeans, peas, beans and clovers, as well as thousands of other species found in a wide range of ecosystems). Rhizobium enters into a symbiosis in which both partners benefit from their interaction: the bacterium gains sugar from the plant, and the plant gains reduced nitrogen. For this reason, legumes tend to be very nutritious and serve as a direct protein source for many people and animals. All the bacterial genes needed for symbiotic nitrogen fixation have been identified. Now, exciting progress is being made in elucidating the plant's contribution to this mutually beneficial interaction, with the identification of crucial signal transduction genes involved early in the response to Rhizobium. The major advances originate from the discovery of plant genes that, if mutated, affect the symbiotic function of the plant. This breakthrough was accomplished by applying functional genomic tools to classic plant mutation breeding, a fruitful marriage of old and new approaches. Precise genetic and developmental controls are required for the establishment of the complex interaction between bacterium and plant. Most significantly, when the legume root is stimulated by the appropriate bacterial partner it develops spherical, cylindrical or coral-like outgrowths, in which the bacterium is housed and where it accomplishes nitrogen fixation (the reduction of atmospheric N2 gas into NH3, which is subsequently assimilated by the plant to form glutamine). These structures are called 'nodules' and are produced from proliferating root cortex and the pericycle (a cell layer along the length of the root that is akin to pluripotent stem cells in animals and is normally involved in lateral root initiation). Nodules are induced by bacterial lipo-chito-oligosaccharides called nodulation factors [1,2]. The invading Rhizobium differentiates into a nitrogen-fixing form within a highly specialized plant membrane, making the resultant 'symbiosome' and the entire nodule fascinating examples of 'cellular sociology' [3,4]. Such intimacy and specificity of interaction clearly require precise signaling and genetic regulation. Thanks to recent genomic advances we are now at the threshold of discovering significant numbers of genes involved in the process of nodulation and it may become possible to expand rhizobial symbiosis to other non-leguminous crop plants. Indeed the full impact on agricultural sustainability of such developments cannot be estimated at this point. Historically, analysis of nodulating plants depended largely on biochemical and physiological data, describing the mechanisms of carbon supply, nitrogen fixation, ammonia assimilation and nitrogen transport. Major emphasis was given to understanding the function of such molecules as the oxygen-transport protein leghemoglobin, expression of which is significantly enhanced in the cytoplasm of infected nodule cells, thus facilitating higher-efficiency oxygen transport to the oxygen-requiring bacterium (the oxygen is used to generate ATP that in turn is needed to split the nitrogen molecule). Evolutionary parallels to oxygen-carrying globins in animals stimulated further interest. A little later in the development of the field, classical techniques involving differential screening of cDNA libraries with RNA from roots and nodules yielded nodule-enhanced gene products, called nodulins. These are divided into two broad classes, comprising either late functions associated with nitrogen fixation (for example, leghemoglobin, glutamine synthetase and uricase) or early nodulins (such as ENOD2, ENOD12, ENOD40, all with unknown functions) . The use of more sensitive techniques, such as quantitative reverse transcriptase-coupled PCR (QRT-PCR), demonstrated that nodulins were often also expressed in other tissues but at lower levels. Today, many nodulins remain 'orphans' for which the gene structure, location of expression and even promoter structure are well described but function remains obscure; as yet, no nodulin has been functionally associated with a symbiosis-affecting mutation. In parallel to the biochemical and molecular approaches, the plant's contribution to the process of nodule development and maintenance has been analyzed by genetics. Using predominantly mutagenesis with the chemical ethyl methyl sulfonate (EMS) followed by selection of the second mutant generation (M2), loss-of-function mutants were isolated for a large range of legumes (notably pea, soybean, Lotus japonicus and Medicago truncatula) [6,7,8,9]. Such mutants demonstrated that plant genes are essential for symbiotic success. The mutations affected events during root-hair curling, formation of an infection thread by the bacterium, nodule initiation, control of nodule number, and nitrogen fixation itself. But correlative studies of plant mutants and nodulin expression patterns failed to discover causative associations between a mutant phenotype and a molecular alteration in a nodulin gene. Knowledge of the nodulation mechanism improved recently when molecular genetic technologies, such as gene tagging and complete genome sequencing, revealed all the bacterial genes needed for both nodulation (Nod and Nol genes) and nitrogen fixation (Fix genes). Similarly, analysis of the plant's genetic contribution required the development of functional genomic technologies such as microarray transcript analysis and map-based gene cloning ([10,11,12,13,14] and A.E. Men, T.S. Linaya, I.R. Searle, I. Iturbe-Ormaetxe, A.K.M. Hussain, I. Gresshoff, Q. Jiang, B.J. Carroll, P.M. Gresshoff, unpublished work). To identify the plant components of nodulation, the techniques of insertion mutagenesis and positional (map-based) cloning, which were developed mainly for the non-legumes Zea mays and Arabidopsis thaliana, have now been applied to legume genetics. Many crop legumes suffer as experimental organisms because of difficult regeneration from tissue culture, which hinders fast and high-throughput transformation, their large genomes (the pea genome is 4,000 Mb, compared to the human genome of 3,000 Mb), frequent tetraploidy, large seeds and long life cycles. These factors prevent large-scale mutant or transgenic screening in laboratory conditions. To overcome these limitations, two small legumes, L. japonicus and M. truncatula, were chosen as models. A few years ago the first true nodulation gene of any leguminous plant was isolated from L. japonicus using transposon mutagenesis with the Z. mays Ac transposable system . In the non-nodulating mutant (nin-1) the interrupted gene encoded a transcription factor that facilitates early symbiosis at the infection-thread stage. It still remains unclear which gene(s) is regulated by the NIN-1 protein. More recently, a number of genes dealing with early signal transduction have been discovered through map-based cloning [11,13], and these are discussed further in the remainder of this article. This approach requires linking the locus responsible for the mutant phenotype to molecular markers that are then used to isolate clones for sequencing and discovery of candidate genes, with eventual sequencing of mutant and wild-type alleles. The critical nexus between gene function and gene structure, hitherto impossible for either nodulins or plant mutants, has thus been achieved. Two non-nodulation mutant genes (LjSymRK and MsNORK) have this year been positionally cloned and sequenced concurrently in L. japonicus and Medicago sativa (alfalfa) [11,13]. The two genes turned out to encode homologs of a receptor-like kinase (RLK). The RLKs family is abundant in plants, with perhaps 150 RLKs predicted to be encoded in the Arabidopsis genome ; they are transmembrane proteins of variable length with extracellular leucine-rich repeats or lectin domains and a cytoplasmic protein kinase domain (a canonical RLK structure is shown in Figure 1). RLKs are involved in hormone reception, growth-factor recognition, the recognition of fungal elicitors, development of shoot and floral apical meristems, and cell-cell recognition . A canonical receptor-like kinase gene such as CLAVATA1 from Arabidopsis thaliana. The leucine-rich repeats differ extensively in number; intron number may also vary significantly - for example, LjSymRK contains 14 introns whereas GmNARK/HAR1-1 has one; and the 3' UTR (untranslated region) often provides a means to distinguish closely related RLK genes (see ). The discovery of the nodulation receptor kinase (MsNORK)  gene was especially significant as its isolation was based on a mutant in alfalfa, which is tetraploid. Given the availability of only a single nonsense mutation, it was significant that analysis of non-nodulating mutations in other legumes revealed alterations in the same (homologous) gene; thus, mutations affecting NORK were also discovered in non-nodulation mutants dmi2 (M. truncatula), and sym19 (Pisum sativum, the pea) . In parallel, the homologous gene, but named symbiosis receptor kinase (SymRK), was also discovered in L. japonicus . Severe mutants with affected NORK product are unable to form symbioses not only with Rhizobium but also with mycorrhizal fungi, suggesting a common pathway for these bacterial and fungal symbioses . Accordingly, Stracke et al. proposed that the fungal symbiosis may have predated the bacterial, perhaps dating back 360 million years to when plants were rootless and possibly required association with fungi in order to interact with the soil (see [18,19]). NORK may be a widely used signal receptor, suggesting a similarity between nodulation factors, fungal elicitors and the 'mycorrhizae factor' that has yet to be discovered, but this idea is put into question by genetic evidence of non-nodulating mutants that nevertheless develop mycorrhizae. It is more likely that other non-nodulating mutants, such as sym1 in L. japonicus or nod139 of Glycine max (soybean)  encode the true receptor component and that this may be closely associated with NORK, forming a functional complex similar to that of the epidermal growth factor (EGF) receptor in animals or CLAVATA1, CLAVATA2 and CLAVATA3 in plants [16,20,21]. Another component of this complex, possibly providing specificity for binding specific nodulation factors, might be the lectin-nucleotide phosphohydrolase (LNP) , which has high affinity for nodulation factor and is expressed on the root surface. Work by Etzler and associates (M.E. Etzler, personal communication) suggests that antibody against LNP blocks nodulation, and that anti-sense expression of the gene in transgenic L. japonicus yields non-nodulating progeny. It is therefore likely that LNP interacts with the putative receptor kinase gene product of Ljsym1 to form the Nod-factor receptor that in turn interacts with NORK. Extrapolation suggests that yet another receptor polypeptide would be needed for mycorrhizal recognition, and that this protein would be closely associated with NORK. Once a nodule is induced, the plant requires a homeostatic control system to regulate the nodule number at a level that balances the burden on the plant with the benefit accrued. In legumes this control is achieved by autoregulation of nodulation (Figure 2), in which initiated nodule primordia signal the leaf, which in turn produces an inhibitor that blocks progression of ontogenically younger nodule primordia [8,23]. Thus, an initial 'burst' of nodules develops during the time needed to establish the feedback loop, after which nodule primordia are initiated but fail to develop. EMS-induced mutations in this process have super- or hypernodulation and altered lateral root development [6,7,9,18,24]; in all cases, except the nod3 mutant of pea, supernodulation is controlled by some part of the shoot. Nodulation of detached, then rooted (and meristem-less) soybean leaves and removal of the shoot apex clearly demonstrated the pivotal role of the leaf and not the apex. Autoregulation of nodulation in legumes. A nodulation factor is received by a complex closely associated with nodulation receptor kinase (NORK), which induces cell divisions. (a) The cell divisions signal the leaf-associated nodulation autoregulation receptor kinase (NARK) to produce a shoot-derived inhibitor (SDI) of further primordial progression. Root NARK activity, however cannot 'cross-feed' to contribute to autoregulation, leading to leaf control of nodulation. (b) SDI is absent in plants with a super- or hypernodulating mutation. 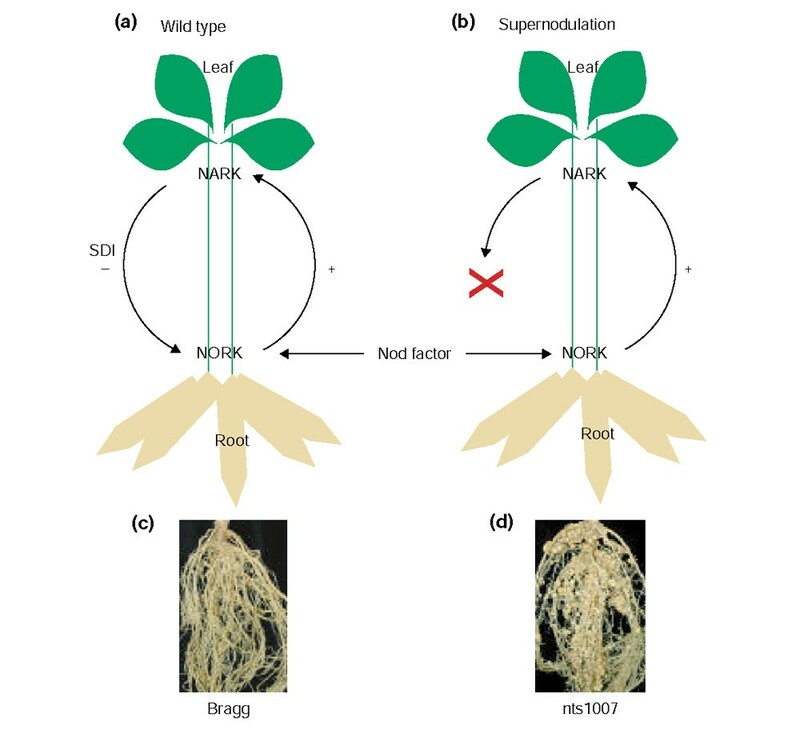 Root systems of soybean with nodules induced by the soil bacterium Bradyrhizobium japonicum show either (c) an autoregulated phenotype or (d) a supernodulation phenotype; shown is a supernodulation mutant nts1007. Photo courtesy of Qunyi Jiang. Searle et al. have used map-based cloning in soybean to isolate an RLK called nodule autoregulation receptor kinase (GmNARK), which is highly similar to the well-characterized Arabidopsis RLK CLAVATA1. The role of CLAVATA1 is to control the transition to flower formation of shoot apical meristem cells after interaction with a related protein, CLAVATA2, and complexing with a smaller peptide, CLAVATA3. Alteration of the AtCLV1 CLAVATA1 gene leads to a 'club-like' shoot apical meristem (hence the name) and additional floral organs . A missense mutation (V837A) in the RLK GmNARK had a weak nodulation phenotype while the nonsense mutant strains nts382 and nts1007 showed extensive supernodulation (between 10 and 40 times the number of nodules found on wild-type plants)  (Figure 2). The Stougaard and Kawaguchi groups [25,26] in Denmark and Japan isolated the homologous gene (HAR1-1) from L. japonicus using similar mutants and positional cloning approaches. They also found similar mutations in pea and confirmed a soybean supernodulation allele (En6500), substantiating new insight into nodule and organ development in plants. What is fascinating about GmNARK/Har1-1 is the fact that its biology is similar to an existing protein complex that is found in non-nodulating Arabidopsis [16,27]. Like CLAVATA1, the GmNARK kinase regulates the fate of dividing and differentiating cells. But supernodulating plants show no detectable difference in their shoot apical meristems, where CLAVATA1 is expressed, and GmNARK is expressed in the leaf and little in the shoot meristem (in contrast to AtCLV1). Supporting the idea of nodulation control via the leaf, expression analysis by QRT-PCR demonstrated that mRNA levels are about 14-fold higher in the leaf than the shoot apical meristem region. It is most likely that high GmNARK activity in the shoot apical meristem could lead to developmental malfunction. Strikingly, CLAVATA1 had not been implicated in longdistance signaling, as GmNARK/Har1-1 now appears to be. Interestingly, GmNARK/Har1-1 mutants in several legumes possess an altered root phenotype especially in the absence of Rhizobium inoculation. This suggests the NARKs have a role in lateral root development. It is possible that the root control is not mediated by a long-distance signal, providing a satisfying evolutionary phylogeny for the appearance of nodule autoregulation after lateral root autoregulation. The discovery of a gene controlling the proliferation of induced nodule primordia (GmNARK/LjHAR1-1), together with the cloning of LjSymRK/MsNORK, opens a new field of functional genomics of symbiosis. Phosphorylation targets, complexing proteins and peptides, and the nature of the ascending and descending signals in symbiosis need to be described. Analysis of the interacting protein partners (Figure 2) requires 'phosphoproteomics' in which patterns of protein phosphorylation are monitored relative to environmental triggers and resolved by mutant studies. Complimentary to this are transcriptome-profiling approaches involving gene arrays. Colebatch et al. have used Nylon-based macroarrays of 2,300 L. japonicus cDNAs to monitor gene expression in roots and nodules. Numerous unexpected 'functional connections' were revealed by clustering analysis and are now the subject of verification. Maguire et al. used glass-slide-mounted expressed sequence tag (EST) arrays of soybean (4,100 UniGene ESTs) to compare root and shoot expression patterns. In both studies the new technology was verified by 'classical' techniques of QRT-PCR and northern blots. Micro- and macroarrays thus are valuable tools for the study of gene networks functioning during the onset of organ development. Molecular knowledge and the integrated application of profiling of the transcriptome, proteome and metabolome, coupled with defined mutations as well as reverse genetics (in which new receptor kinase gene constructs are introduced into gene deletion lines such as soybean mutant FN37 (A.E. Men et al., unpublished work) promise a bright future for the modulation of nodulation.